The MMO industry has been somewhat stagnant lately for me. Yes there are a lot of things going on with nearly every game (Warhammer RvR packs, World of Warcraft Cataclysm Expansion, etc.) but none of which really excites me....'TIL NOW! Sure, I might still test out rolling a Worgen Warrior in Cataclysm (I have an unopened copy of the expansion sitting on my shelf awaiting my return) & I may even try out the Skaven in Warhammer Online...heck, I might even be tempted to check out what is new in Aion or Age of Conan but in the long run none of these games truly peak my interest compared with the thought of testing out an entirely new title by the name of RIFT, developed by a relatively unknown company named TRION. Get ready for that to change in the coming months though. I have been watching the game RIFT for quite some time now. In fact I have been watching it ever since it was called "Heroes of Telara". The reason is mainly due to the vast array of class selections that peak my interest (read: drooling) and the incredible looking "Souls" system. I enjoyed multi-classing in DDO where I made a Fighter/Barbarian which was quite fun but with RIFT you can go the extra mile and splash in a third "Soul" leaving the possibilities quite broad in terms of player customization. Needless to say I have watched this games development for quite some time and over the last few weeks when beta was announced I have been scouring the internet in hopes of finding a RIFT VIP beta key. There were two keys available for the closed beta. 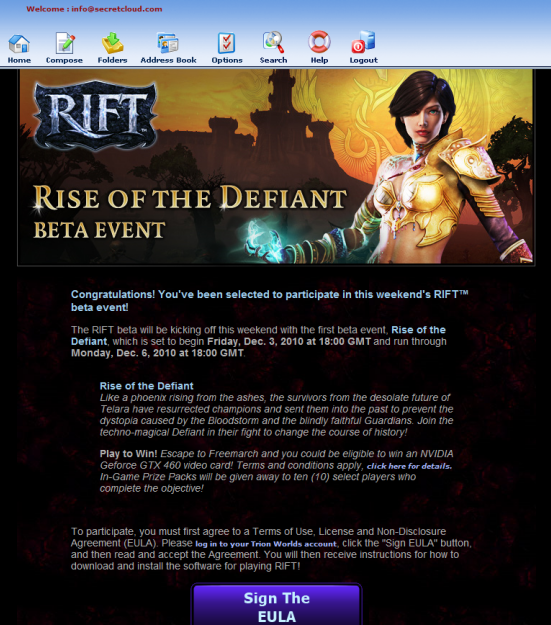 One was the RIFT "chance" beta key and the other was the RIFT VIP beta key. When applied to your account the RIFT "chance" key gives you a chance that you will be invited to one or possibly a few of the events. The RIFT VIP beta key guarantees that you will be invited to participate in ALL of the beta events with the first to be held this upcoming Friday, December 3rd, 2010. This first beta test will allow beta testers to experience levels 1-20 and also includes some nice perks for completing some in-game requirements including the chance at winning a very nice NVIDIA GeForce GTX 460 video card. Acquiring a "chance" key took me a little bit of googling & was quickly applied to my account. Afterall, a chance at beta is a lot better then no chance at beta. So began my hunt for a VIP key to ensure that I would be included in all of the beta events. After becoming an active member of the RIFT forums to my surprise I was offered a VIP key sent to my private message box within a few days of posting & creating a few connections. Incredible! Somehow I have slyly made my way into ALL beta events and I couldn't be more excited. So here I am currently downloading the client & I simply cannot wait to test out RIFT two days from this post. In my opinion & many others this game is currently the industries hidden gem RIFT is a hidden gem (Massively) & I will be there from the beginning assisting in it's development to launch. I will be sure to update my blog in the coming weeks with bits of information. As you know when beta testing you are required to sign a NDA (non-disclosure agreement) so I will obviously have to keep my tongue sealed on certain things so that I don't have my privileges revoked but I will do my best to share things that do not break my agreement. Posted by Secret Cloud at 10:23 p.m.
December 13, 2010 4:54 p.m. The game is quite nice. Considering it was the first beta I feel there is some room for improvement but the TRION team definitely has a solid game on their hands. December 15, 2010 2:16 a.m.